Sceptics a TV crew and a Medium. From the darkest recesses of Essex director Steven M. Smith (Hooligans at War: North vs. South, Essex Boys: Law of Survival) brings us a twist on the found footage horror film. 5 stars of heaving bosoms, blades and brainsss. 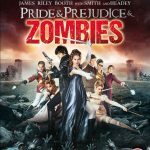 Pride & Prejudice & Zombies is based on the original story and characters from the classic 1813 novel written by Jane Austen and has undergone quite a significant transformation at the hands of Seth Grahame-Smith. 2 stars for this vaguely creepy but ultimately disappointing horror film. The Forest is the directorial debut of Jason Zada, best known for writing The Houses October Built. Although it is a valiant effort, the lack of experience clearly shows here. 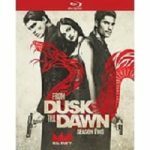 Taken from Quentin Tarantino‘s (From Dusk till Dawn) screenplay and re-imagined by Robert Rodriguez (Sin City: A Dame to Kill For) the director of the original film and creator of cable network El Rey. 4 stars for this enjoyable horror with a great twist. Visions is directed by Kevin Greutert (Saw IV, Jessabelle) and is produced by Blumhouse, the producers of Insidious: Chapter 3 and The Gift.